Music Festivals Have A Glaring Woman Problem. Here’s Why. It’s 2011 and I’m on a plane to Miami. I’m ready to soak up some sun and kick back at my sister’s apartment in South Beach. As an afterthought, I’ve agreed to go to one of the largest electronic music festivals in the world, Ultra, for the first time. As I skim through the lineup — which included big names like Tiesto, Deadmau5 and David Guetta — I think to myself: Where are all the women? I was about to fall deeply, madly in love with electronic music and the whole festival scene. But out of the dozens of festivals I went to after that first one, I never stopped asking the same question: Where are all the women? HOW BAD IS THE GENDER BREAKDOWN, REALLY? Move the sliders to pick what percentage you think each group makes up for all the 2016 festivals we looked at. Your selection adds up to 0%. Get it close to 100%. Use the — guides to get there. Your selection is close to 100%. Are you ready to see the what we actually found? 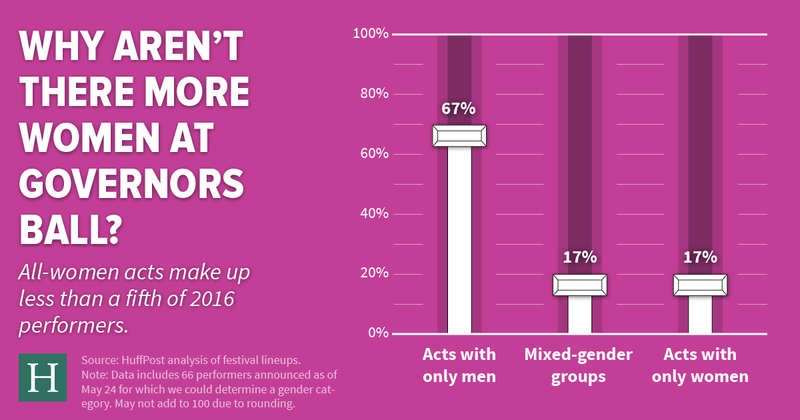 For the 10 festivals we looked at, women artists (single performers or all-women groups) made up only 12 percent of acts in 2016 — compared to 78 percent male performers (single or all-male groups). Your guess is marked in — pink. Source: HuffPost analysis of festival lineups. Read our methodology. Thirty-two million people attend music festivals every year in the U.S. Over half (51 percent) of those attendees are women. But on stage, the demographics are very different. Coachella’s 2016 lineup included 168 male artists and just 60 female artists — a figure that includes both all-female and mixed-gender acts. Ultra’s 2016 lineup only featured 20 female artists, while a whopping 198 exclusively-male acts made up the rest of the weekend. 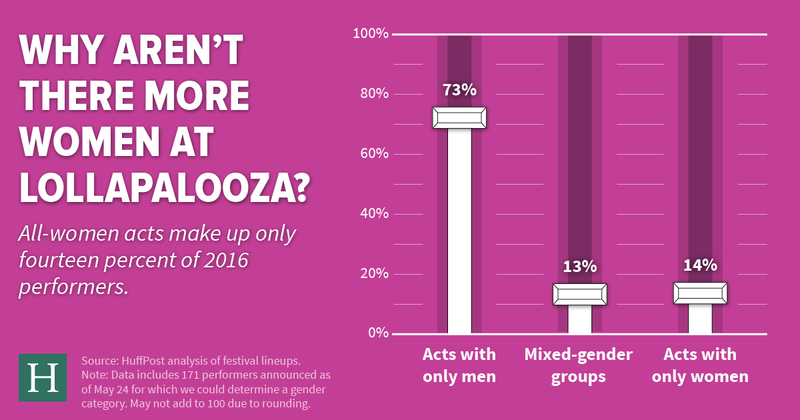 Lollapalooza tapped 124 male acts to perform at its 2016 festival, and only 47 female acts. That’s a pretty dismal imbalance — and, unfortunately, that gender disparity isn’t anything new. The lack of women artists at music festivals has been discussed… a lot. But where’s the real disconnect? How many female acts really are at these festivals — and has that number changed over time? And if women are dominating the music industry, why don’t we see it reflected in festival lineups? To investigate these questions, The Huffington Post looked at the lineups from ten different music festivals — Bonnaroo, Coachella, Outside Lands, Lollapalooza, Electric Forest, Electric Zoo, Hangout, Governor’s Ball, Firefly and Ultra — from the past five years. Festivals like Ultra and Electric Forest are dominated by electronic dance music (EDM), while others like Bonnaroo, Coachella and Outside Lands offer a more diverse range of musical genres, including rock, rap, EDM and R&B. 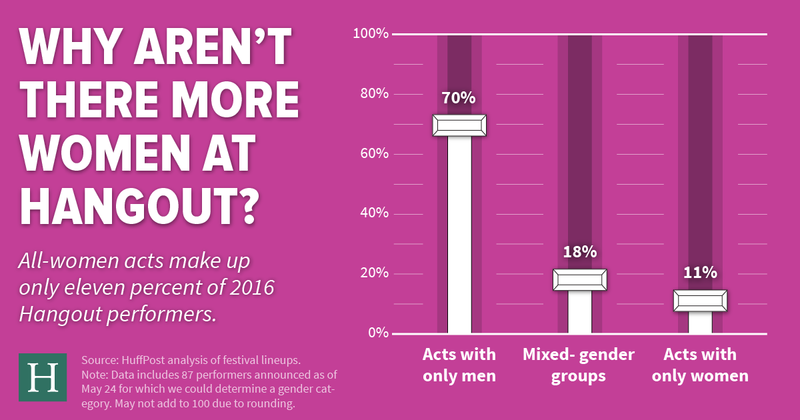 From the 50 lineups we looked at, we broke down the percentages of all-male acts, all-female acts and mixed-gender acts in each festival’s lineups from 2012 to 2016. This left us with ten festivals and almost 6,000 performers over five years. 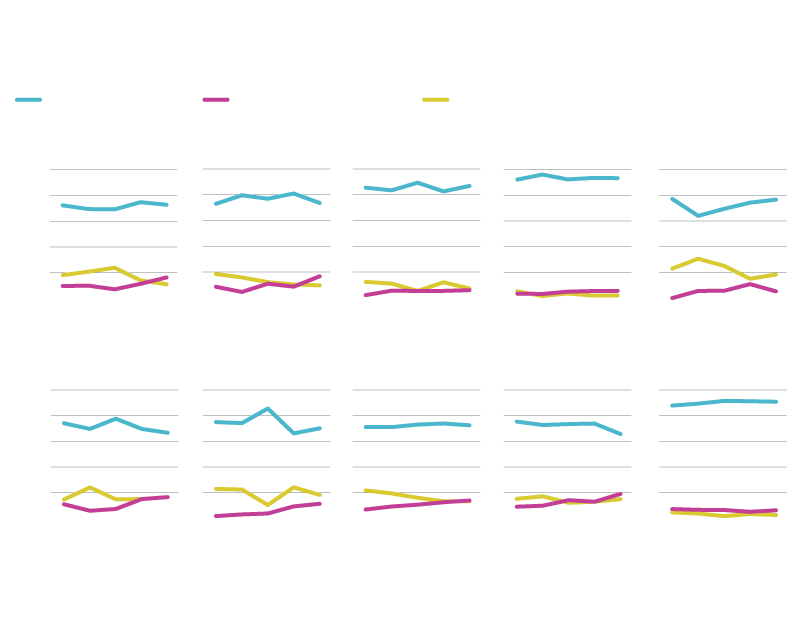 In all ten cases, we found a startlingly large gender gap — and one that has stayed fairly steady over the past five years. Some festivals have more female performers this year than they have in the past. But not a single one is even close to acheiving gender parity in its lineup. Source: HuffPost analysis of festival lineups. 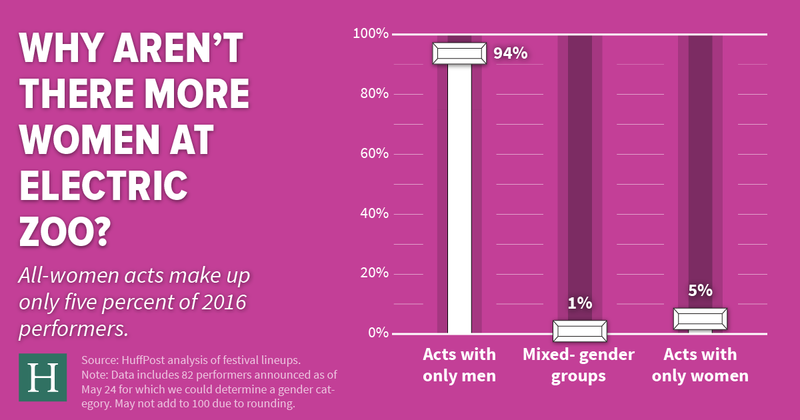 Note: For fewer than 1 percent of the acts in festival lineups in the last five years, we could not determine the gender breakdown, and those acts are not included in these charts. Read our methodology. Across the board, all-male acts make up the overwhelming majority of festival lineups, ranging from 66 percent of all performers (Outside Lands and Governors Ball) to 93 percent (Electric Zoo). 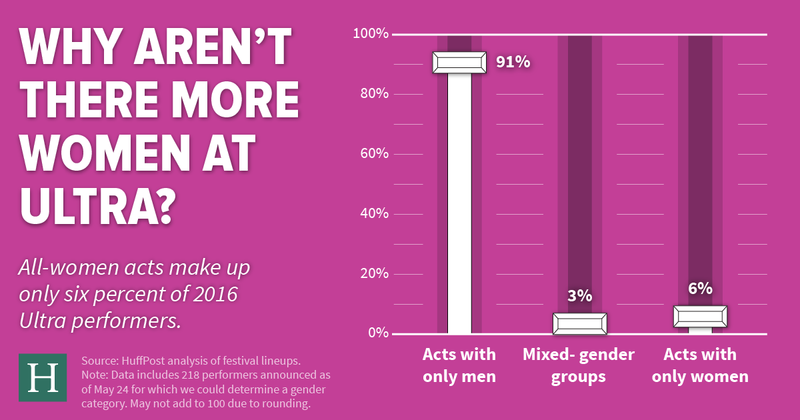 Since 2012, the percentage of all-female acts at these festivals has increased slightly. Ultra is the only festival where there has been zero increase in women performers, with all-female acts plateauing at a solid 6 percent. 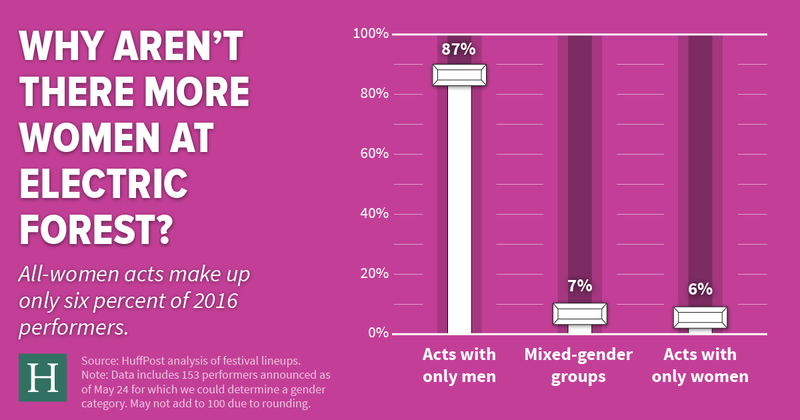 Mixed-gender acts fare a bit better than all-female ones — though not by much. 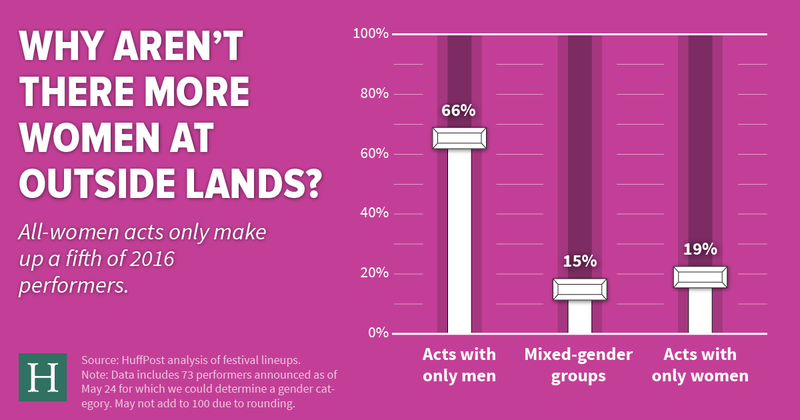 Over the past five years, mixed-gender acts made up a higher average percentage of festival performers than the all-female acts in all nine festivals other than Ultra, and (just in the past two years) Coachella and Outside Lands. One explanation for Ultra having a higher percentage of all-female acts (6 percent) than mixed-gender groups (3 percent) is that most acts are DJs — meaning there are fewer group acts overall at Ultra than other festivals. 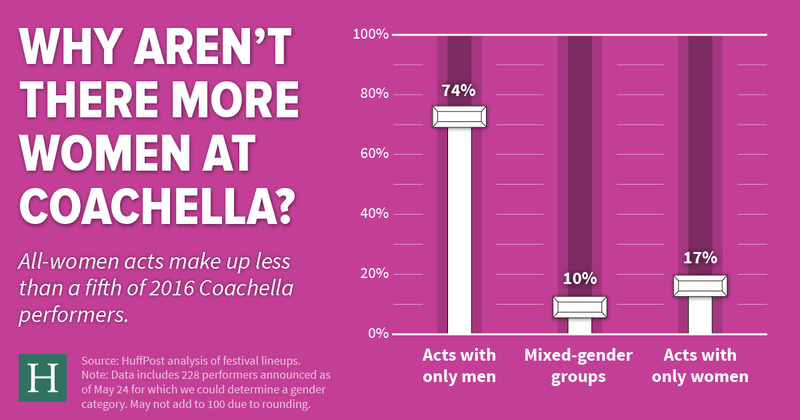 One thing that stood out in our analysis was that EDM-centered festivals (Ultra, Electric Forest and Electric Zoo) have a larger gender imbalance than more mainstream festivals. Ultra had 90 percent all-male acts over the past five years and Electric Forest had 85 percent. 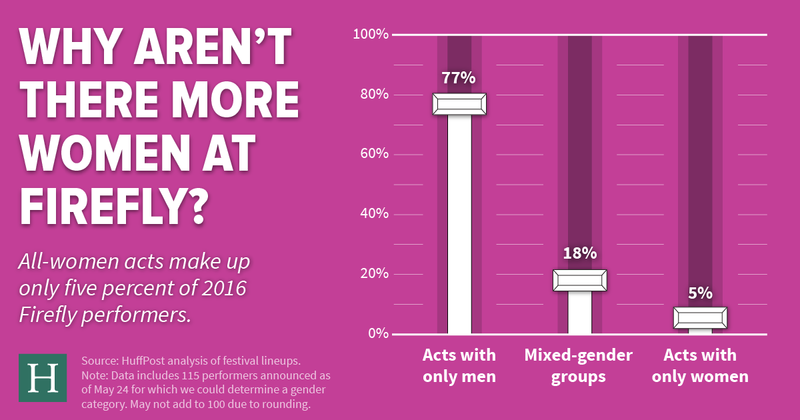 More mainstream festivals like Firefly and Lollapalooza still had a large gender imbalance, but the gap was smaller. Both festivals had 72 percent all-male acts over the past five years. 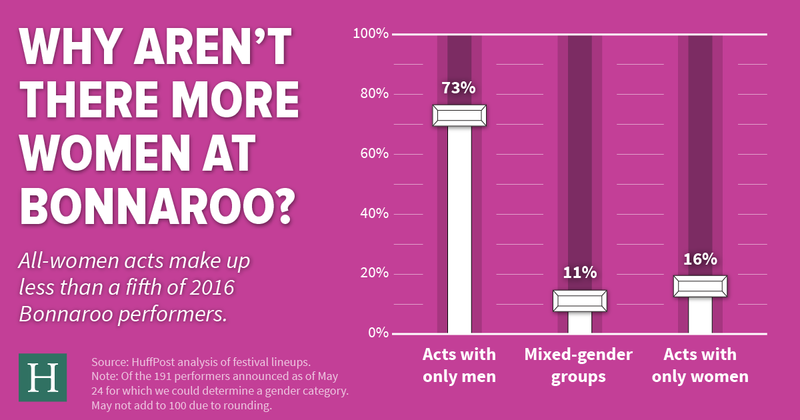 Or, share the gender breakdown of other 2016 festivals. SO, WHY IS IT LIKE THIS? Women make up half of music festival attendees — and therefore, make these festivals a ton of money — so why aren’t the festivals catering their acts to female attendees? This holds up especially true for electronic dance music festivals. EDM is notorious for being one of music’s largest boy’s club, with women making up just 11 percent of artists at electronic music festivals in 2015. And in 2014, just 18 percent of EDM labels included women on their rosters. Jahan Yousaf, of the electronic DJ duo Krewella, thinks that EDM’s gender disparity is also exacerbated by stereotypes about women’s technical capabilities. Emma Olson, a NYC-based DJ by the name UMFANG, told HuffPost that growing up in the EDM industry, she was conditioned to believe she wasn’t good at the technical side of DJing simply because she’s a woman. Pasquale Rotella, CEO of Insomniac events — which puts on big-name EDM festivals like Electric Daisy Carnival — agreed with Yousaf, telling HuffPost that there’s simply more men on the production side of EDM. Plus, creating a festival lineup takes a lot of time — anywhere from one to two years. Executive Vice President of Programming for Superfly (the production company behind Bonnaroo) Chris Sampson told HuffPost that headliners are sometimes even booked a few years in advance. The brains behind the Bonnaroo lineup are made up of a small, diverse group of four to six people, Sampson said. Two of the people on the committee are women. So why are there no women at the top? Scott said much of it has to do with scheduling. “I think it’s reflective of touring artists as a whole,” he said, adding that timing has a lot to do with who we see headlining festivals. If popular female artists aren’t touring during festival season, it’s much harder to book them. Shirley Halperin, Billboard News Director and music editor at The Hollywood Reporter, agreed with Scott that much of what we see in lineups is a result of scheduling issues. 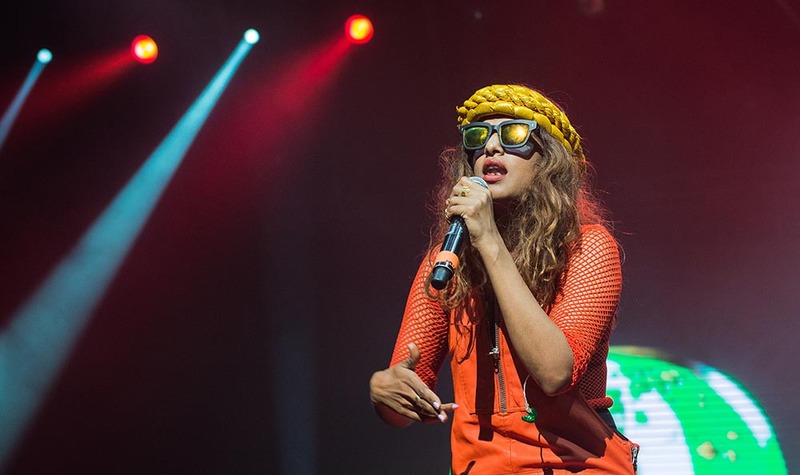 M.I.A. performs in Paris, France. Photo by David Wolff - Patrick/Redferns via Getty Images. But aren’t many of the big female headliners — Lana Del Rey, Florence and The Machine, Ellie Goulding, Halsey — considered pop artists? Halperin added that some big female pop stars don’t perform at festivals because they want to be the main act — not just part of a lineup. But there are a lot of successful female artists that don’t fall under the pop genre. And while we do see some big names towards the top of set lists — M.I.A., Elle King, HAIM, Ellie Goulding — the list of female artists that make it onto lineups seem to be a small pool of the same people. So what’s the solution? It’s not so clear cut. At the end of the day, there’s no one person wagging his finger saying, “I don’t want women in my music festival lineups!” Like many issues of structural sexism, music festivals’ gender imbalance is a complex one. Part of it comes down to the simple fact that there are more men in the music industry. In a male-dominated business, it’s inevitably going to be harder for women to break through at every stage — whether that’s the all-female indie band playing gigs in a bar or the PR girl who can’t seem to make it up the chain of command to become a CEO or EVP. And sometimes gender simply isn’t a factor that comes up in the decision-making process. Programmers like Bonnaroo’s Sampson and Outside Lands’ Scott choose artists by their sound and the mood they’re looking to set. "Tame Impala is an incredible band,” Sampson told HuffPost. “We know that Tame Impala playing late-night on the second [Bonnaroo] stage would be so incredible. It didn&apos;t matter if Tame Impala was led by five women or five men, we knew that we wanted that style of music and that band on at that time." Ultimately, the problem with getting more female-led acts onto festival stages is the same problem all industries face in trying to make women more visible players: Sexism is systemic and often subtle. And more often than not, you can’t solve a systemic issue from the top down. Going to a festival this year? Share its 2016 gender breakdown. Additional contributions by Hilary Fung, Emma Gray, Adam Hooper and Shane Shifflett.